When I posted summer pictures last week, I promised I would get to autumn, and so -- here it is. I know that a lot of people love autumn for it's crisp days and bright colors, but I love it for the mist. 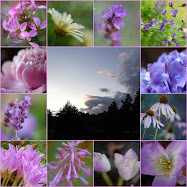 Your photographs are amazing Mary! Oh my Mary, Beautiful pictures. We have not any misty mornings this season. Fantastic captures Mary...they have an eerie quality to them. Such fabulous shots! We don't usually get such misty days in my corner of the world, so I really appreciated these photos today. I found them rather soothing and romantic. Mary, I love these misty morning photos. Beautiful captures. Oh my, Those pictures are wonderful! The mist makes everything look so mystical. It's almost eerie, but I love the way it looks. I love the mist too, although here it can develop quickly into a thick fog. There's nothing nicer, on the drive home from town, to climb towards Pondside and into the mist that hangs over the hills. So beautiful and ethereal, Mary. The fog is pretty rare around here, so I am enjoying yours. Thanks for sharing - Great photos. Thanks for hosting again - I am slacking and did not get a post ready for this week. Absolutely glorious photography. We don't get to many days like this. Thanks for sharing and hosting. These photos are absolutely breath-taking. I sent your blog to my husband so that he could see the pictures. He was just as taken with them. Beautiful! Wow, I love these mosaic! 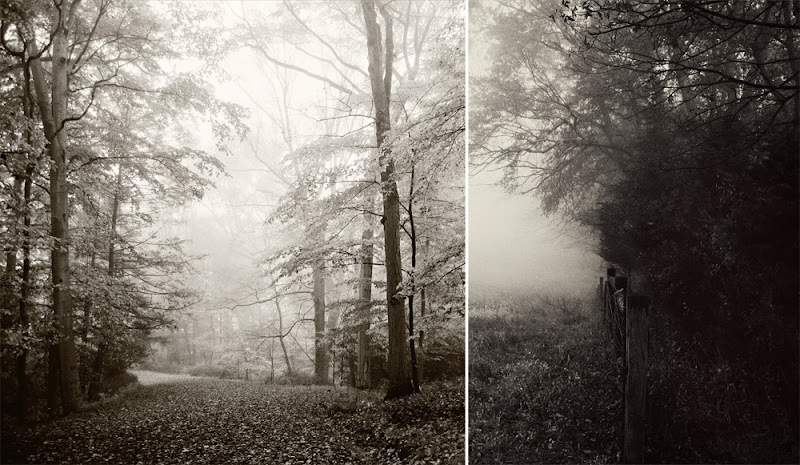 Love the misty photos! It reminds me of my grandma's in the mountains of Pennsylvannia (chin quivering). WoooW! It' s a poem. 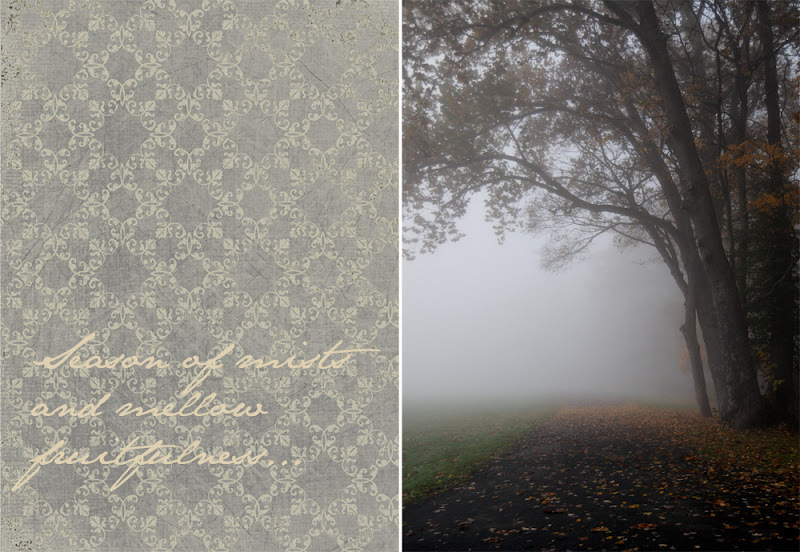 You have perfectly captured misty, moisty October. Ooops..I somehow posted on last years mosaic monday, but I'm glad I got to see your blue transfer dish. Glad I'm up to speed now. 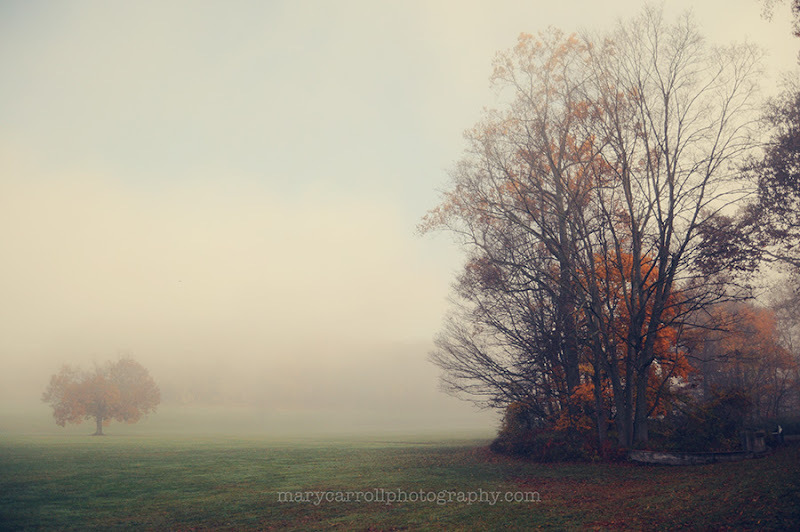 Mary, you certainly captured the mists of autumn! These photos are beautiful. The perfect 'other side of the coin' of wonderful October. It's been a while since I've been able to join Mosaic Monday, but I'm glad I can do it this week...I've missed all of you. Such a sense of calm comes over me as I look at your beautiful photos. Lovely, Mary, just lovely. Looks like our neck of the woods. Photos are exceptional. Fantastic photo's Mary. Real autumn sights. To repeat those favourite words once more..."I think that I will never see a poem as lovely as a tree." Mary - you have such a special gift for beautiful compositions in your photographs! Dreamy images, Mary! We haven't had much fog/mist yet but it will come. Lovely shots. I love misty days. Your photos are gorgeous. Mist adds a sense of mystery and enchantment to the landscape. I can just envision Heathcliffe striding over the moors. Your photos are lovely. A true Autumn in the Mist. 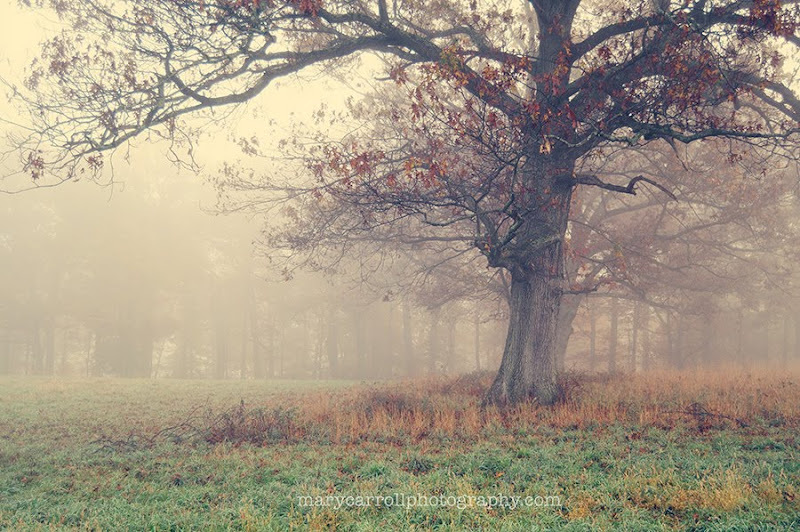 You've captured the mist so beautifully! I love the misty scenes, Mary. There's such an ethereal quality to them, very romantic. YOU are the very best photographer I have even known..and I am an OLD lady. Perhaps some of it is that the photo's you take so appeal to my senses..bring me peace. A sense of quiet.. I will always be fan of yours, even if I don't make it over here very often. Oh Mona, you are so sweet! Thank you so much from the bottom of my heart, for taking the time to visit and for leaving such a lovely comment!